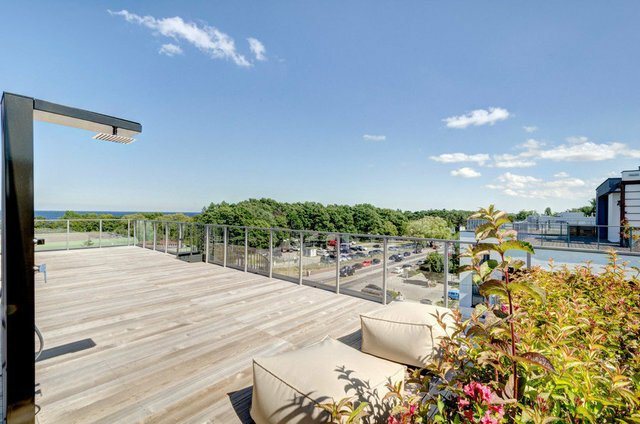 A two-level penthouse in Gdańsk Jelitkowo overlooking the Gulf of Gdańsk, 200 meters to the beach. Tre Mare Residence, consisting of only 63 apartments, is an investment of NDI Development, a valued and well-known premium real estate developer. It is also a complex finished with high-class materials, designed with attention to detail, consistent with the surroundings and the character of this unique location. The neighborhood of the beach, park, tennis courts, swimming pool, windsurfing and sailing school, spa centers and top hotels - provides residents with a sense of prestige and comfort of living, which enhance the facilities in the form of a leisure and recreation zone with fitness club, sauna, club room, internal and external space dedicated to the youngest. Presented penthouse is undoubtedly a beautiful showcase of Tre Mare. A two-level apartment, occupying the second and third floor, with a total area of ​​236,17 sq m, is a fully furnished, interestingly arranged space in the Scandinavian style, ready to welcome new owners. - master bedroom with access to the terrace, going to the bathroom. - bedroom with a separate living area, exit to the terrace and access to the bathroom with a bathtub. The ubiquitous wood, bright carpets in the bedrooms, stoneware in the bathrooms, bright buildings - give this place a unique taste, making it elegant and consistent in its simplicity. Complementing the apartment is a 120-meter terrace located at the top with a separate space for the pool - designed and reconstructed to meet the expectations of the most demanding, and at the same time providing the enormous experience that provides a view of the Gulf of Gdansk and the surrounding area.